ApocalyptiGirl: An Aria for the End Times is about Aria, a woman living on earth after civilization, as we know it, has died. 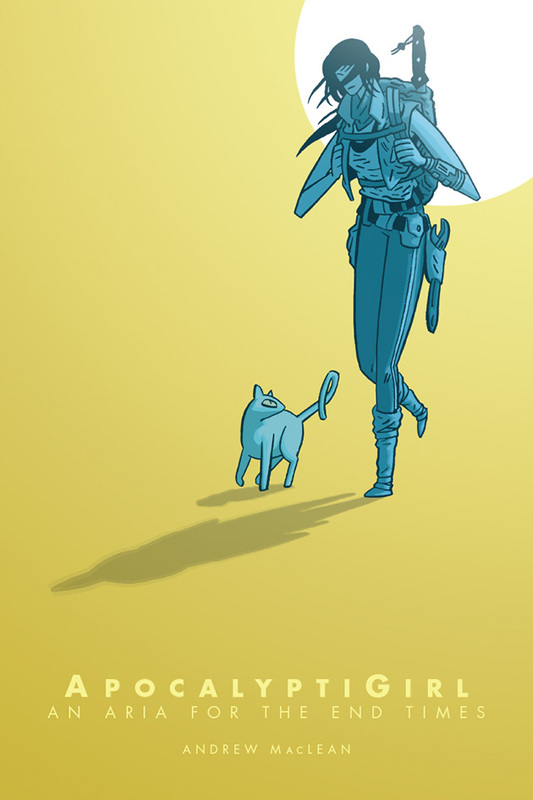 Every day she treks through an overgrown city looking to find an ancient relic of immeasurable power. If she finds it, she completes her mission and gets to go home to her own planet. But she’s been looking for this relic for the past six years. Her only companion is a white cat named Jelly Beans, who she considers to be her boyfriend. She has to deal with two warring tribes, the Blue Stripes and the Grey Beards, who are in Aria’s way when it comes to completing her mission. 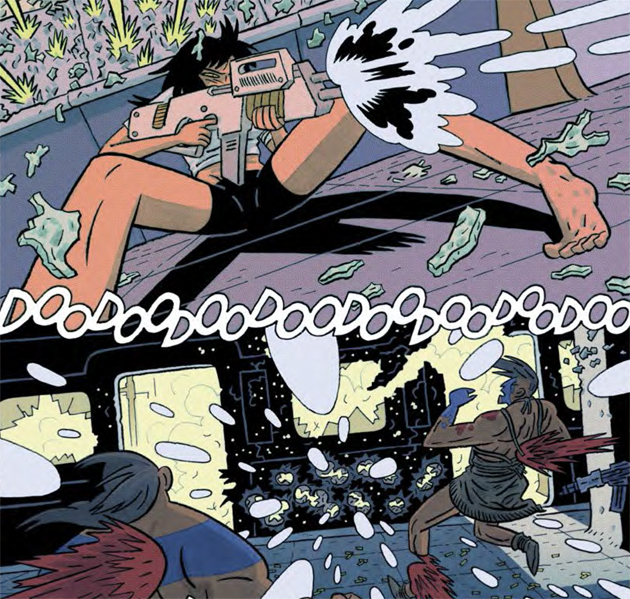 All right, stories about people who are living alone after the Apocalypse are very common and ApocalyptiGirl isn’t without the trappings that come with this genre. 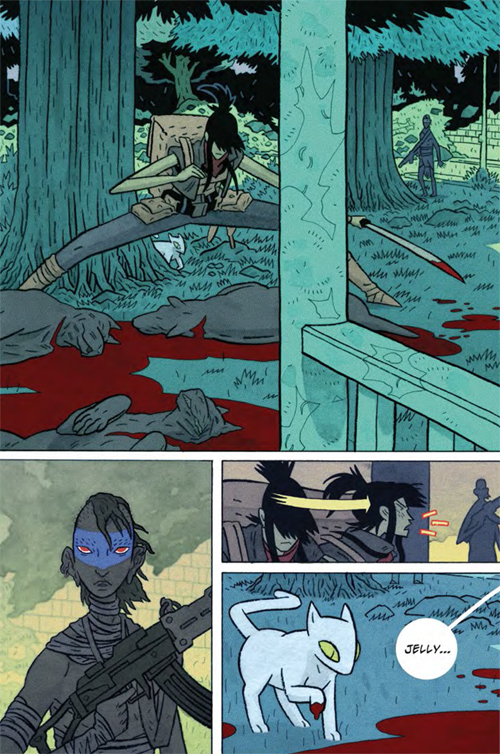 But this setting is only a familiar framework to tell a story about the relationship between a woman and her cat for Andrew MacLean, who is the writer, artists, colorist, and did the lettering for this comic. It’s this relationship between human and pet that lends the story her humanity. Also, I liked MacLean’s stylized art, which is very energetic and consists of some very effective compositions. The problem I had with ApocalyptiGirl is that I never felt any real tension while reading it. This is because Aria is such a skilled warrior; she doesn’t really have a hard time dealing with her enemies. Therefore, the confrontations aren’t really exciting to witness. It’s only in the end, when Aria is about to be picked up but instead of waiting at the rendezvous point is looking for Jelly Beans, that I started to worry if all would end well for her.